On one side of the lot is a huge brightly lit tram shed, and on the other a large terrace of six story apartment buildings, separated by a high wall. It is an arena of sorts surfaced with tarmac and divided into sections by mobile wire fences. There is an entrance gate which is never locked though sometimes closed at night. Inside the lot following on from the tram shed on the south side is a row of factory and office buildings. Towards the end are some with high windows, the second to last one rented by Bertrand Vollieme. Peering through the windows it appears to contain a veritable wealth of rubbish and detritus. The height of this huge space is at least ten metres, and some items reached within a metre or so of the roof. At first I was overwhemed by the extent of Bertrand`s collection of what I should call `ordure` which extended throughout the building. He showed me around and and we reached the third floor I began to realise the huge scale of the collection. I was to make use of a room which prior to his occupation had been an office. It still contained three connected cupboards which were full to overflowing with materials pertaining to his own activities. He wasn`t sure what the building had been used for previously. There was a sealed room at the end of a corridor adjacent to the office room which he called the `poison room` which he had been prohibited from using, and was not a part of his lease. The office room contained a large collection of typewritiers, and some sinks and other things, a few carpets and a folded up camp bed, and some sheets of hardboard lying against two walls on which were glued A4 sheets of browning typing paper filled with texts in German. He said he collected the typewriters because he was interested in the variety of typefaces. I could just about squeeze in through the door. He generously offered to allow me to stay there but I declined. He did give me the key to the building however, and I was free to come and go. I was intrigued by the collection, and then I realised that Bertrand did actually live there, sleeping in a cul-de-sac on the first floor along a corridor tangental to the main passageway from the first to the second floor. It was hidden by some doors and and a heap of kitchen utensils. I didn`t see the exact place where he slept which he told me was like a large cupboard, and was the kind of enclosed womb like space he enjoyed to sleep in. I did think of R.Y. Sirb who I was sure would have been fascinated by the collection and the relationship between it and Bertrand`s daily living round. Bertrand is an old friend, but he has always kept a part of his life to himself. It was very generous of him to invite me to stay in the room of the typewriter and enamelled sink collection. I have now accepted and have been able to survey the collection at leisure. I divided my time thinking about his collection and the fate of R.Y. Sirb. At first sight the collection looked like a huge heap of junk, impressive nonetheless. He said he has been considering building a few paths on the top of it all, as a second layer. There is is still a lot of unused space up there towards the ceiling, and he is an enthusiastic mountain walker having been well taught by a `klettern hexe`, i.e. a climbing witch. Building another layer on the top would be a pleasurable task for him. he said that he has already travelled across the top surface several times looking for missing objects. There were some other factors: for Bertrand is in his subtle way the most direct person, stubborn, independent, and therefore paradoxically vulnerable; he implied that not only was this a collection- he doesn`t think of it as`ordure` abfall, mist or schund, but that it also contains some works of art. The whole collection is made up of objects which could be assimilted into configurations as art works, taking into account those already in the mix. This is in marked contrast to R.Y. Sirb`s position I think where the collection in it`s entirety would be considered to be an art work. I think Bernard would be distressed by this notion. Once I began to examine the collection on the ground and discovered configurations, associations of objects which appeared to have been put together for unknown purposes which could concievably be considered to be art works, although they were invaded by, penetrated by the free flowing association of objects held in tension by the confines of the building and the forces of gravity. Their coherence was of a different order. He led me to make these distinctions, and then I could see the tops of art works rising above the rough sea like surface of tightly packed objects. While he shyly pointed out the tops of art works in this raging sea of artefacts I remembered that he had been an artist among other things. I thought he wasn`t practising any more but here he was, a secret serial artist. I could see that collections are animate live things as long as the collector lives. As I sat in the chair opposite Bertrand in a backwater of the collection which lay all around us on the first floor, looking accross at him I could see his bald head just below one of those world map orbs, suspended from a window frame in a harness from which a tassle hung just above his head. For a brief moment I hallucinated and momentarily glimpsed a view of him dressed in a smoking jacket. Then as he bent forward to make a point in the conversation he moved across a century into the new millenium. In the next few days I had ample opportunity to examine the surface of the collection. It wasn`t possible for me to go into it physically without pulling it all apart. Bertrand goes to bed in the morning at about eight am and sleeps until two or three in the afternoon. I keep more conventional hours retiring at about eleven pm and rising at eight. We did manage to meet especially as my bedtime slowly drifted into the early hours when he was most active, before he went out dancing, or to his favourite bars. Currently I think the collection made up as it is of singular objects and materials, is so tightly packed, that it has become a solid conglomerate, an object, a thing. The only recourse to enter its accretive formulation is to climb on to it, or push one`s way into it rather like fighting one`s way into dense undergrowth. If each part as Bertrand suggests is a discrete entity then to fully come to terms with it should probably entail a complete distentanglement, and the laying out of its parts. This would require an enormous space space, something akin to the tram terminus next door. But would this satisfy the notion of thereby knowing it? I think not. My own view which I suspect would be shared by Rosse Yael Sirb who in my opinion is the authority on this matter is to see the collection as an object, where the object of the collection is to create an object as a work of art. I imagine that the object as a work of art is site specific, or site sensitive. It could theoretically be rehoused and still be experienced as an object, the meaning of which would be inextricably bound to its confinement within a restricting space. I know this is not Bertrand`s view. He seems to think of the collection as being precisely that, where materials and objects are all in a condition prior to being formed into art works. And as has been indicated within the collection there are a number of what he claims to be works of art, which have been exhibited by him and are being stored among the collection. In the short period of my visit I was surprised at how much more material he added to the collection on a daily basis. I was also considering the collection as an object which cannot be seen from the outside apart from those surfaces the walls of the paths made through it to the door in the back wall and the open stairs which afford a view accross the top. The idea of a raging sea of material is invoked when looking accross it from the stairs. There is a tension between the thick undergrowth of its interior and the wildly raging visible surfaces. The internal structure, all the information contained in it can never be known unless it is dismantled and ceases to be an art work. I think R.Y. Sirb would appreciate the irony. The building could be described as a `dump` in a vulgar sense of having limited facilities e.g. for washing, toilet etc. It had been a warehouse or factory of some sort and was not set up for domestic habitation, although all connections for water etc. were in place. The collection had evolved by a process of taking displaced materials and artefacts and `dumping` them in the building. But the process of dumping is not an adequate description of the effects, because of the discretion used in the selection of the elements and the manner of their juxtaposition. Another factor is that the motivation is not to dump as a means of `getting rid of unwanted items of one`s own belongings. It acts as a resting place, a store for displaced material which for most part still retain evidence of prior functioning and have consequently been selected for Bertrand`s collection of objects of potential value, in the making of art works. R.Y. Sirb might well say that the effects of this process alone constitutes an art work. If he sees it I think he might incorporate it into his lexicon of unrecognised art works, all of which involve the notion of ordure. Another factor which would intrigue R.Y. Sirb are conditions which are normally kept separate which Bertrand has brought together. The collection, the art works, and his own domestic life have found accommodation up to a point. R.Y. Sirb would regard this integration as stemming from a radical position. My view of Sirb`s contention is that `radical` is defined as `proceeding from or going to the root of the matter'. In political terms he uses it from a non-conformist perspective. Bertrand collects his finding from the street. One night just after midnight as I was walking through the arena towards his place, he surprised me by suddenly appearing beside me on a bicycle carrying a large enamelled sink, and a plastic bag filled with assorted bits and pieces. He carried them inside and and I saw how the collection grew. He placed the sink along the pathway leading to the door at the back end of the space, took the bag upstairs, and sitting down in the area on the first floor which he used for sitting examined what he had found, and then laid them on piles of miscellaneous objects which lay all around him. He knew exactly where most of the items he had brought in recently were. More than once he was reduced to searching for something he couldn`t immediately locate, as they had been covered over by more recent acquisitions sinking under the layering of the collection. This didn`t seem to cause him any anxiety, and after a perfunctory search he would say "well it will turn up sometime or other". As I was cutting my toenails and collecting the pairings for disposal I did wonder whether they should be added to the collection. I found a small plastic bag under some used tea leaves, a tea bag and a scrunched up brown paper bag and put them in. When I next saw Bertrand that night I mentioned the toenails and he was somewhat scornful, saying not only were they not to be a part of the collection, but that I had inadvertantly put them in his bag of rubbish for disposal. This answered another of my questions. Apart from the fact that he had the facilities to dispose of human waste and did so. Did he collect everything else? The place didn`t smell of rotting food for example, unless he opened the refrigerator. But he had already mentioned that the smell was the aftermath of some particularly rancid cheese he had got rid of some days previously. A few minutes after the refrigerator was closed the smell faded away. He didn`t encourage others to contribute to his collection. It was important to him that everything in it resulted from his own activities. An obvious characteristic of the collection is the preponderance of objects which retain evidence of function prior to disposal. Bernard is an optimistic person, centred on the paradigm of redundancy-re-use, which belies the seemingly functionless appearance of the collection. As it increases in size and becomes monomorphic i.e. the collection as a single object, so its potential usages seem to fall away. But this is not a concern of his, who continues to see the collection in strictly pragmatic terms, as a conglomeration of materials from which art works might be made. The concept of the collection as a unified object gathers credence however as dust which falls on it exemplifying stasis, the lack of movement and change. The appearance of functionlessness is not neutral but negative, inducing notions of decay and death. He contradicts this tendency towards toxicity by interspersing for other reasons discrete art works, which when identified stand like beacons. The collection from his perspective rests on the fulcrum between intimations of death and the re-invigoration of art in process, a secular interpretation of redemption. Late one evening Bertrand invited me to see the poison room. The entrance door was at the end of a corridor the left hand wall of which being the outer surface of the wall in the office room containing the typewriters and enamelled kitchen sinks where I slept. The corridor was filled with bicycles some standing on top of each other, and on one side a long row of cupboards. I helped him move the cycles into the typewriter and sink room which was now blocked right up to the entrance door. He opened the door to the poison room and sure enough I could immediately smell a strange metallic odour. I couldn`t identify it but he thought it was a combination of chemical odours with overtones of sulpher. It was host to a huge system of vents and ducts coming up from below, some of which passed on up through the ceiling leading to the flat roof just above. The dull grey colour of everything in there combined with the smell suggested that we were in close association to a heavy extraction system. It was reminiscent of submarine interiors. With the aid of a ladder we climbed to a second level and could see the layout of the huge vents more clearly. We were quite dwarfed by it all even though the room was not large. As we climbed back down the ladder I noticed what appeared to be a primitively plastered clay wall and asked him what it was. He seemed quite reluctant to reply but eventually mumbled something about sound proofing. It transpired that being involved in music (he is an accomplished saxophonist who plays free jazz) he had built a sound proof studio inside the poison room just after he moved into the building, but after a short while didn`t use it for fear of being poisoned. The poison room seemed to hang like a heavy presence as though everything was oriented to it. The collection in its fragile state lay dead in the water on the one hand, and the subject of his infectious enthusiasm on the other. It sat like a black dog on his shoulder. I didn`t recognise Bertrand at first as he walked through the reeds surrounding a small pool near the cafe where we were due to meet after all that time. When I had known him previously he had a full head of hair. I was surprised to see a bald man advancing energetically towards me who I half recognised but couldn`t quite place. He later told me that he had shaved his head because he had gone quite bald on the top, and because what was left grew in different colours on different parts of his head and made him look ridiculous. He felt better to be rid of it, but would have prefered to have a full head of hair. He was wearing a loose tee shirt, jeans and running shoes, and was heavier but more graceful than I remember him to have been. It was sunny and warm most of the time, but the evenings were getting cooler. In his building the range of temperatures inside seemed to match those outside. One cool night he complained of being cold, and disappeared into his sleeping area, returning shortly afterwards wearing a dark coloured long shaggy woollen coat. I complimented him on it as it gave him a distinguished air, which he regarded sardonically, and showed me a huge tear in the fabric which he had casually tacked back together in a cunning fashion. It wasn`t so much repaired as reconstructed in a theatrical manner. He had reconstituted the image but had not actually sewn the huge rent back together so that it could bear regular usage. It was in keeping with the way he wore his clothing. He said the coat was made of alpacca and was incredibly warm. He had found it among detritus left after a street market which he frequented every week to look for items of interest. There were a few others who also scavenged there and they formed a close knit band, each knowing what the others were looking for, and collaborating in the searches. He was appreciative of this collective approach which he thinks characterises a dimension of social life in the margins, and is an antidote to the sterilising effects of rampant consumerism. His financial and cultural interests were somewhat diferent to the others who he assumed were living at the base of the social system. He is an extraordinarily flexible adept character whose many activities take some organising. The phone rang continually and although he spoke German, French, Dutch and Russian at times, and even occasionally in a Swiss mountain dialect, I could understand enough to see that the collection was merely the tip of an iceberg. His activities spread far beyond the building. He told me that the collection and the artworks distilled from it were in actuality the centrepiece of his project, where his ambitions were completely in focus. He always had plenty of cash ready to hand, and was expansively generous. His day to day activities were involved with the exchange and displacement of goods of all sorts and kinds. I suppose he is what I understand to be a general dealer. We talked about it one evening and he said that he knew that the collection and his other activities were superficially similar, but considered that they were in fundamental opposition to each other. Out of dire need to earn a living he had begun to trade in the market and then progressed to dealing in second hand goods, straddling the line between legality and illegality. He said it gave him no pleasure. The collection and his art activities more than compensate for the way he makes a living. It is because of his adoption of the `merchants aesthetic` that he is able to rent the factory build the collection and have a studio, which I didn`t get to see, and I wonder if it actually exists. His independence gained from being `self employed` is adulterated by the laws of the jungle the market adopts, which he finds repugnant. This argument goes round and round in his head, he says, and seems to have no solution. The dichotomy is critical to R.Y. Sirb's consideration of the integration of art and life. The market took place on saturdays, and it was one of the regular features of his week. His clothes varied from what he described as being suitable for a `beggars ball` to rather elegant suits and casual clothes all of which were at odds with predominating sartorial trends. For instance one day he wore a pair of `seventies bell bottom trousers which were then fashionable, and were cut differently to contemporary bell bottoms which parody the style. Most of his clothes fell into this genre. He was so outre fitting anonymously into a crowd unless a closer appraisal was made, and then his essentially peculiar individuality would come to the fore. It is reminiscent of the character portrayed by Charlie Chaplin in silent films whose style and grace was both suppported by the conventions of the high class origin of his apparel, but undermined by their threadbare broken down condition. This deliberate assertion of and fall from conventional values is not however an essential part of Bertrand`s persona. The confirmation of his separation from the margins of society is the fact of his economic security and his arguments to support his behaviour which challenge the social and political order and place him only circumstantially in the margins with the other scavengers. He is a regular visitor rather than a permanent resident. Unlike Chaplin`s tramp he doesn`t accept the predominant values of the social order, but has found the means of survival without compromising himself too much. He did speculate on the circumstances of the others rummaging through the market waste but hadn`t found any evidence to suggest that anyone of them was in some way or other not what they seemed. But he couldn`t assume that they were only doing this for reasons other than trying to live as well as they could in the gutter so to say. He was different and the others would be aware of it. However in terms of the `honour` that exists among thieves and among them, he said they were unfailingly gracious and sensitive to each others needs. This collective support and sensitivity is in marked contrast to the individualistic competitions of consumerism. I see his anarchic tendencies in stark contrast to the machinations of the market economy. And yet what he and his cohorts are doing is also a form of consumerism. He agreed, with the proviso that it was more like a masquerade, where the underprivileged consort to unconsiously mock what they have become excluded from, have abandoned, or been unable to reach. Bertrand collected clothes in much the same way that he added to his collection of objects and materials. And he didn`t make any distinction between them. In the middle of this converation he passed over a small snapshot to me as an aside of little consequence, or was it one of those deliberately underplayed moments when something of potential significance was taking place. Uninterrupted he continued, "When I wear the clothes discarded by others, I gain power as though, they have thrown something of themselves away which I acquire." I didn`t know what to say. This was something new. His appearance didn`t change to any degree during my visit. He had several relatively similar changes of clothing. The weather was warm and apart from one day didn`t rain. He wore mostly tee shirts blouson in the evening, wide trousers and running shoes. Once or twice he wore a tyrolean jacket and a cloth cap which gave him a strange regional look, but from what region? The combination of cloth cap and tyrolean jacket was perplexing. He is obviously a `dandy` and is very conscious of the reading and mis-reading of his fluctuating image. Apart from that it didn`t alter the way I saw him. It is true that in this short time of two weeks or so we were warily re-acquainting ourselves with each other, and my perceptions of him changed and deepened to some extent. Really I suppose I reached the stage where I realised that I didn`t know him well at all. There were parts of his life I might have shared in but didn`t, others I had no interest in, and others he kept to himself. I needed to remind myself that my purpose was the pursuit of R.Y. Sirb, the Curator of Ordure. Later I looked at the snapshot that he had casually passed to me. 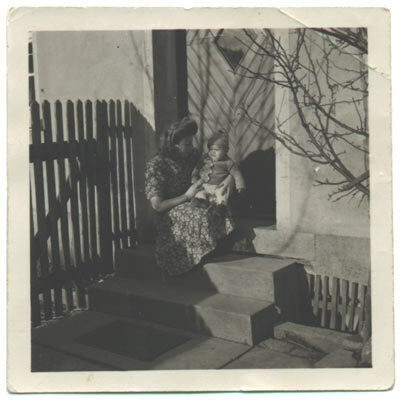 It was of a woman sitting on the steps of a house in strong sunlight, holding a small child. By the look of her hairstyle and her dress the photograph was taken early in the fifties. On the back was a rubber stamped address:- Photohaus Schaffner, H1 19 Munchberg. Munchberg is a small town just to the south of Hof near the autobahn between Berlin and Munich. The border between East Germany and Czechoslovakia with West Germany was a short distance to the north east and east. The photograph is in black and white in warm tones which suggests that cadmium was used in the printing proces. I had discussed my interest in R.Y. Sirb with Bertrand and the fact that the only information I had was from the ex Professor of English at the University of Zagreb who I met as a corporal in the Mixed Services Organisation and who knew R.Y. Sirb as one of the guards at the camp near the East German border near Helmstedt. The baby or toddler in the photograph couldn`t possibly be R.Y. Sirb who would have been in his early twenties in the middle fifties. He might have been related, being the father even or an uncle, or a cousin. But there was nothing to show any connection to him. Nonetheless Bertrand had given it to me, and when I approached him about it the next day he was quite cavalier and said "If you are so keen to establish this guy`s background why don`t you add a little artistic licence to spice it up a bit?" I was taken aback for a few moments. I had no intention of making fiction out of it. I could because R.Y. Sirb refused to reveal anything about his background, although he had admitted that he was in the Mixed Services Organisation and had been a guard at the camp near Helmstedt. He would probably be quite happy for his past to be shrouded in make believe, and maybe relieved. I had the impression that Bertrand was amusing himself at my expense.